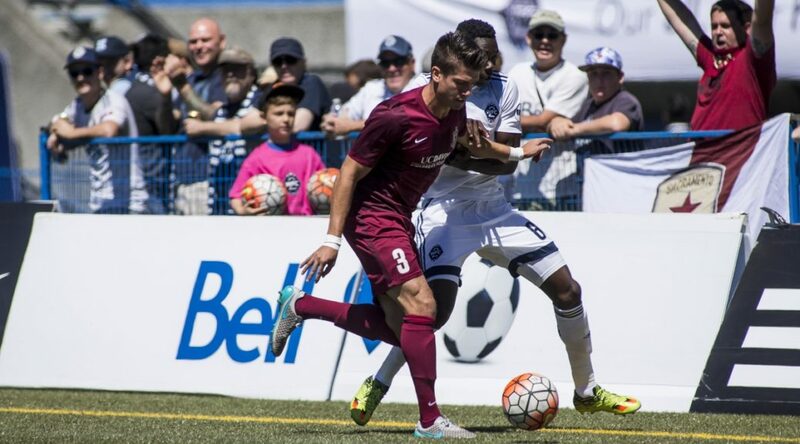 A stoppage time goal propels Vancouver Whitecaps FC 2 past visiting Sacramento Republic FC 2-1 at Thunderbird Stadium. The match started strong for Sacramento Republic FC, who just 14 minutes into the match found the first goal of the match. Midfielder Danny Barrera had the ball in the center of the field before sliding it through the middle of the Vancouver defense to a streaking Cameron Iwasa. The forward received the ball and went one-on-one with WFC2 keeper Spencer Richey. Iwasa drove up the left side of the box before sending a low shot to the bottom right corner that cleared the sliding Richey, putting Republic FC ahead 1-0. The lead would not last long however as just six minutes later WFC2 would earn a penalty. Forward Kyle Greig was taken down in the middle of the box as Kadin Chung tried to swing a cross into the middle, earning WFC2 a penalty. Marco Bustos stepped up to take the ensuing penalty kick and sent a low shot into the left side of the goal as Republic FC keeper Evan Newton dove right, leveling the score 1-1, where it would stay until halftime. Republic FC had the first strong chance of the second half in the 55th minute when defender Kip Colvey drove down the right wing. Colvey then sent a cross toward Adam Jahn. The forward connected with the cross, but his right-footed volley went just over the bar. In the 76th minute, Republic FC had another good look on goal. Defender Chris Christian played a long ball from midfield to Jahn who held up the ball in the middle of the box. After settling the ball, Jahn laid it back to Iwasa who was sprinting down the right side of the box. Iwasa sent a low, powerful shot toward goal, but Richey quickly got down to his side to make the save, keeping the match even at 1-1. Vancouver would break the deadlock two minutes into stoppage time. WFC2 substitute midfielder Fatawu Safiu played the ball wide to Daniel Haber who was streaking down the right side of the field. Haber then sent a cross into the box, where substitute forward Thomas Sanner connected with the cross for a header into the lower left corner of the goal and past a diving Newton, giving Vancouver the 2-1 win. Republic FC continue their five-match road stretch when they take on Rio Grande Valley FC Toros on Saturday, July 30. Kickoff is 5:30 p.m. PT. The match will be streamed live at SacRepublicFC.com/matchday.